BLIMEY! 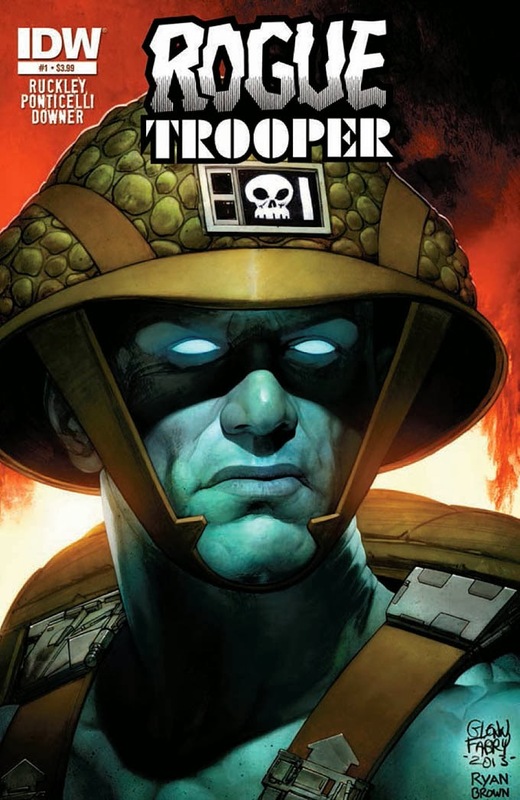 The Blog of British Comics: Rogue Trooper returns! 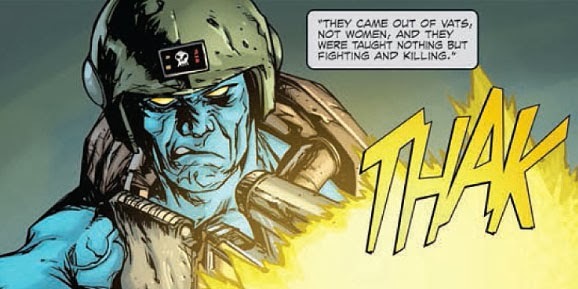 Rogue Trooper returns to the printed page this Wednesday, - in a brand new monthly comic from American publisher IDW. Originally created by Gerry Finley-Day and Dave Gibbons for 2000AD in 1981, Rogue Trooper told the story of a G.I. (Genetic Infantryman) created for war, and his three comrades who had their personalities downloaded into 'bio-chips' in Rogue's helmet, backpack, and rifle. The strip became a firm favourite in 2000AD and returned several times with various artists and writers. With the character licensed to IDW, Rogue Trooper No.1 kicks off the story anew for a fresh audience. The script is by Brian Ruckley, with artwork by Alberto Ponticelli. There are a several variant covers, but the main one (above) is by Glenn Fabry. For some reason, IDW have redesigned Rogue's distinctive helmet. The new version may be more practical because it covers his ears, but is fairly bland. That original helmet design by Dave Gibbons was a striking part of the character's look, and is still featured on the cover of the new comic so it seems odd that the interior strip hasn't used it. Rogue Trooper No.1 goes on sale on Wednesday March 5th at $3.99. Available in comics speciality shops, but not newsagents.